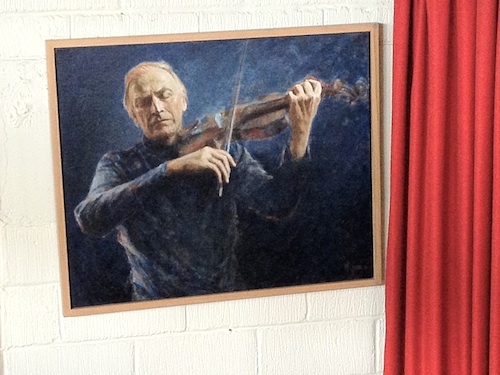 July 14, 2012, 9:48 AM · One of the things I wanted to do while I was London was to see violin pedagogy expert Simon Fischer and visit the Yehudi Menuhin School, where he teaches (when he's not teaching at Guildhall School) along with Natasha Boyarsky, Lutsia Ibragimova and Akiko Ono. I'm happy to report that I spent a wonderful afternoon there last weekend, and I came just in time to see a couple of the school's Summer Festival Concerts, which each feature about a dozen students, who each play a short selection. I've always been curious about the Menuhin school, founded in 1963 by the violinist Yehudi Menuhin, who was known not only for his early life as a prodigy, but also for his writings, diverse interests, and humanitarian efforts. 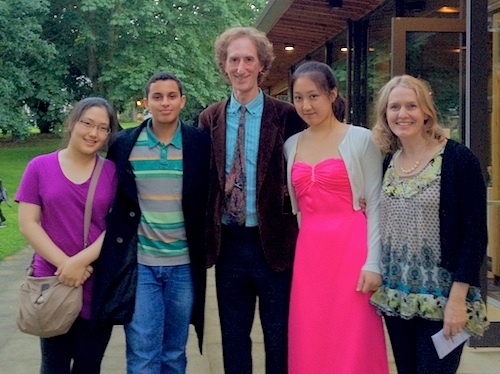 The Menuhin School is located in Stoke d’Abernon, a small village in Surrey, south west of London. (I took the train with my family, and on our way, my daughter, husband and I enjoyed afternoon tea at a great little out-of-the-way place in Esher called the Chocolate Teapot). The students include more than 60 children ages eight through 18, from countries that have recently included UK, Ireland, France, Romania, Lithuania, Switzerland, China, Korea, Japan, New Zealand, Canada, Dominican Republic, Malaysia, South Africa, Bulgaria, Azerbaijan, Ukraine, and the USA. I saw some wonderful performances, and I couldn't begin to describe them all, but here are a few highlights: First of all, I have to give an immediate shout-out to the collaborative pianists. The instrumentalists are all accompanied by fellow student pianists, and I was so impressed with these collaborations. For example, pianist Katie Morgan, at age 12, played with great sensitivity with her partner, violinist Vladzimir Chmel, only 10 years old himself. Later in the evening, at the second concert, Dorian Todorov nailed the accompaniment for the Saint-Saens "Introduction and Rondo Capriccioso," played with some nice up-bow staccato from violinist Haim Choi. Is anyone familiar with how difficult that piano part is, with the orchestral tutti? No doubt the orchestra reduction is ridiculous to play, but I seldom hear it played with all the notes in place, so it was a real treat. I really enjoyed violinist Yume Fujise's "Chaconne" by Bartok. This was a piece I didn't know, but she played it like a pro. Honestly, I'm not hitting nearly everything; there were other violinists, and cellists, bassists, solo pianists. Watch out world! The door to this room looks like the door to a broom closet -- a nondescript wooden door that says "Recital Hall" on a tiny hand-written piece of paper, no bigger than a business card. The room smells like the wood that lines its narrow balcony, a balcony with space enough for just one row of little red chairs. The ceiling is also made of wood, fanning out from a high-set, enormous window, which provides both natural light and a view of the bobbing branches of a big evergreen tree. 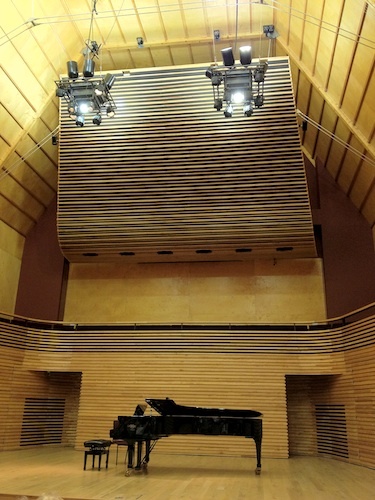 Two grand pianos sit at the front. Windows at the back of the small hall overlook the enormous green meadow at the center of the campus. Who played here, who taught here, in the silent room where I was sitting? I wondered. Considering the teachers, students and guests that have walked this school's grounds, there must have been some very special moments: besides Yehudi Menuhin himself, famous musicians who have visited the school over the years include Itzhak Perlman, Gidon Kremer, Dmitri Sitkovetsky, William Pleeth, Mstislav Rostropovich, Louis Kentner, Vlado Perlemuter, Zakhar Bron, Mauricio Fuks, Bernard Greenhouse, Murray Perahia, John Lill, Dora Schwarzberg, John Williams and Andras Schiff. 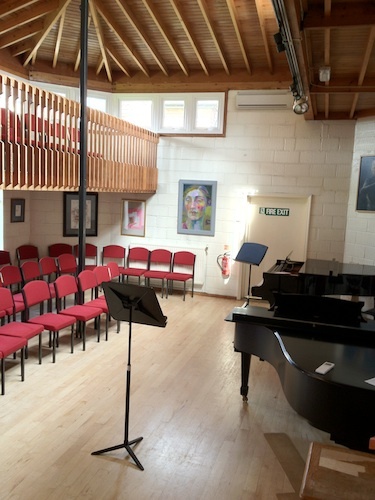 Alumni of the school include violinists Tasmin Little, Nigel Kennedy, Nicola Benedetti, Alina Ibragimova; cellists Tasya Hodges, Colin Carr and Paul Watkins; pianists Melvyn Tan, Kathryn Stott and Paul Coker; and the Endellion, Grainger and Belcea Quartets. That's not to mention the kids playing here right now, and what they will go on to do! I did indeed speak with Simon Fischer, who recently came out with a new book called Scales, and who showed me the mark-up copy of his newest book, called Tone, which is a companion to his recent DVD, called The Secrets of Tone Production on all Bowed String Instruments. The book, Tone, is due out this fall. "The teacher sets a process in motion, rather than imposing it." "The teacher's role is to instruct the student in the art of self-correction, of analysing and thinking, taking decisions, then applying them to the task in hand." "The teacher's ultimate aim is for the student to become independent - to become a master rather than a pupil ... the teacher must be both." July 14, 2012 at 10:55 PM · Great blog Laurie. For the many middle and high school students who ask if they have started too late - this sort of information gives you your answer. July 14, 2012 at 11:13 PM · this is fascinating, thanks so much -it's one of the best reasons to read v.com!! July 18, 2012 at 02:41 AM · Thank you Laurie! What a wonderful read. I will certainly share this with all my colleagues. July 18, 2012 at 12:02 PM · An excellent read. 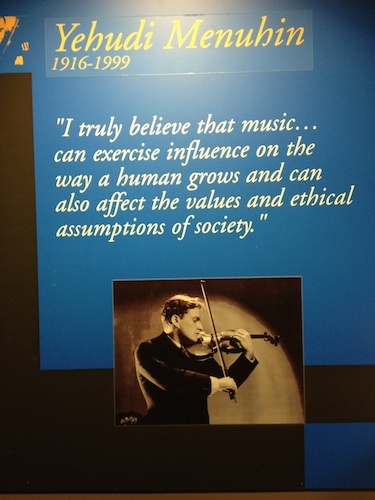 Menuhin was such a great man. July 18, 2012 at 06:37 PM · Thanks for posting this one! When I was in high school, Menuhin was my favorite. I took a lot heat for it, but that's the way it was. He was a violinist, a conductor, and deeply involved the Bath Festival Orchestra. I actually got to hear him in live concert, accompanied by his sister, Hephzibah. He did the Franck sonata and (of course) Bach Partita no.2. 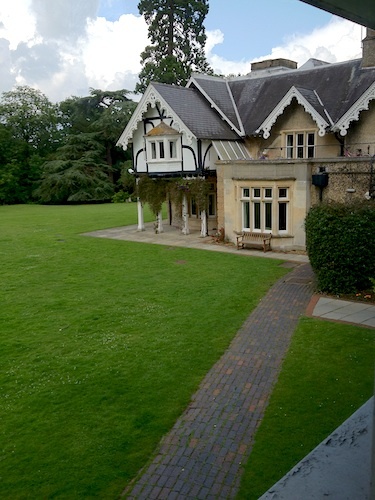 I recently was wondering about the Menuhin School and spent a while doing a virtual tour via Google maps and the school's website. I was very impressed. So Laurie, your report is bang-on, in my book!